I’m kicking off “Me Made May” with a bang. I have totally hand sewn a T-shirt! I bought this organic cotton fabric from Alabama Chanin and it is dreamy. I’m wearing it here with a skirt I made years ago. 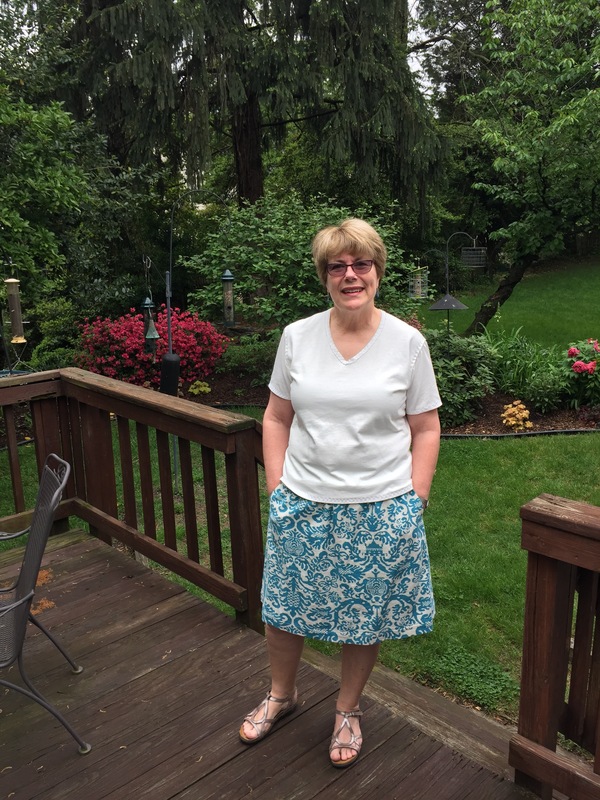 The pattern is the Everyday Skirt from oliver & s. It is an easy sew and I love the pockets! To make the top, I traced around a favorite T shirt that I owned. I used a folded knit band to finish the neckline and sewed it down with a decorative stitch incorporating small little chop beads as I went. 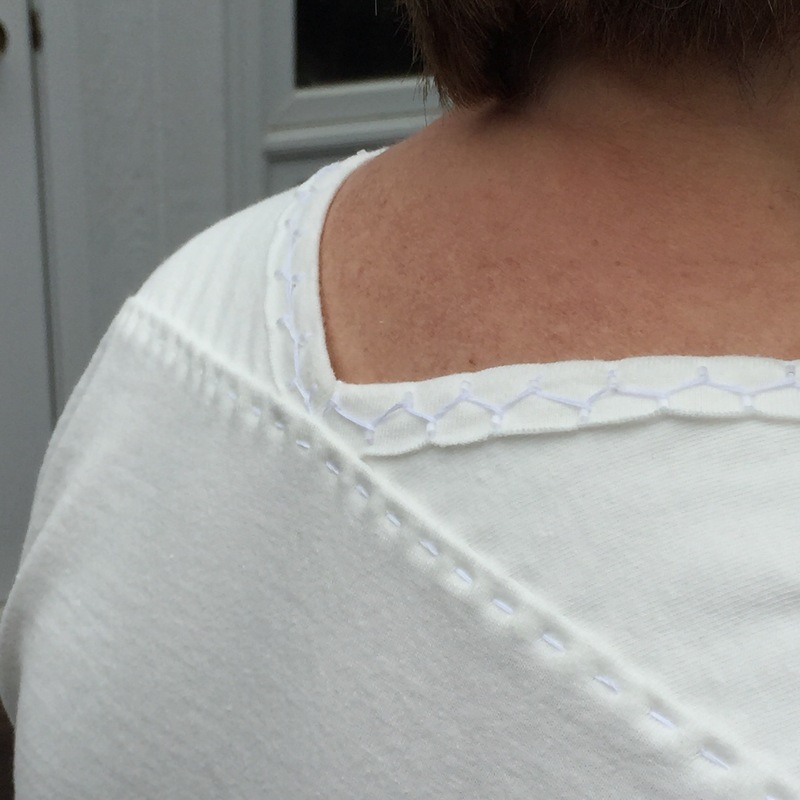 I hemmed the bottom of the shirt and the sleeves using another decorative stretch stitch found in the book Alabama Studio Sewing + Design. 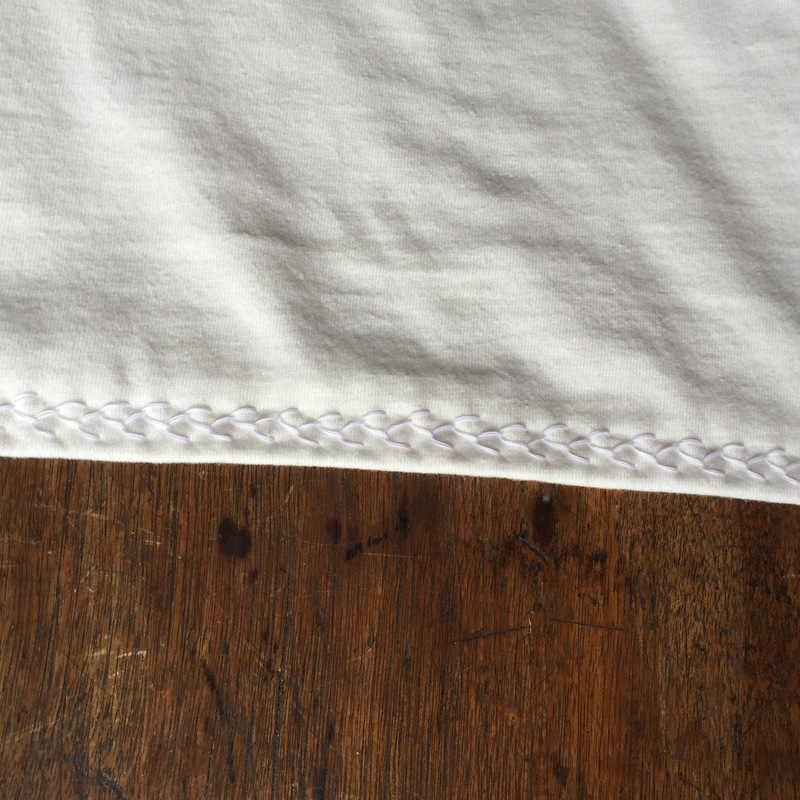 All of the seams were hand sewn using a regular running stitch and then felled to one side also with a running stitch. 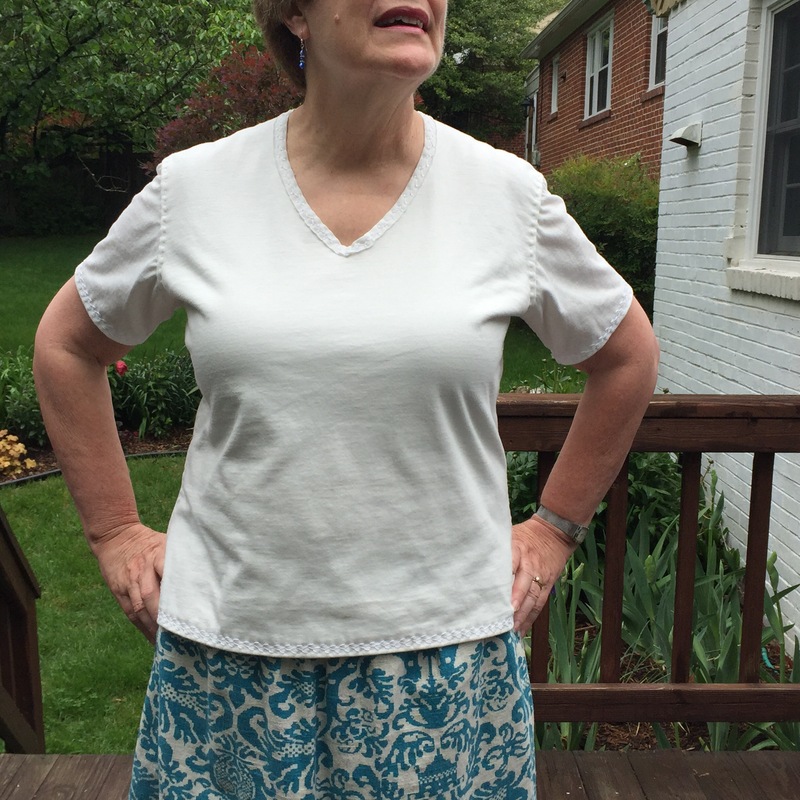 I made this shirt specifically to wear with the Alabama Chanin skirt I am currently sewing. I guess I had better get going on that! 1 of 4 skirt panels. This is a double layer of knit that has been stenciled and then “quilted” together and the top cut away to expose the underneath layer. I used 2 layers of cotton knit on the front of this shirt and only one layer for the back and sleeves. I thought I might do some reverse appliqué on the front but put the bottom layer of knit with the right side towards the inside of the shirt. I could probably still cut and expose the layer with the wrong side showing, but it would bother me. Next time put both right sides facing the same way as I did with the skirt. I found the directions for Creating Mitered Binding for a V-neck in the book Alabama Studio Sewing Patterns on page 22. Directions for garment construction and the stretch stitches are in all of the books.Alabama Studio Sewing + Design has them on pages 24 – 27. Same book (as#3) has a page of pretty circular stitches – Pg. 81 These are used for a beautiful skirt on page 101 of the Alabama Studio Style book. I am so impressed! Its beautiful. I love the decorative stitch details. The skirt is also going to be a work of art. Thanks Nita. It is really satisfying to sew items like this by hand. I get a lot done on the skirt when I travel because it is so easy to take along. Linda, I am so impressed. Hand Sewing! And embroidery and bead embellishments. It you tell me that you quilted and ” “trapuntoed” the skirt material I won’t know what to say!!! I have to find a master sewer badge for you!! Thanks Alice. This has been an adventure. I may still add some embellishments to the shoulders and neckline of the shirt. I don’t want to do so much to it that I can’t just wear it any day though. I’m not sure where to draw the line. There are some photos in the Alabama Chanin book of white on white embroidery with a few beads here and there that I love the look of! Linda, I love the beautiful embroidery stitches you used! And the skirt will be stunning. You do such beautiful work. Thanks so much Sharon. This has been such a fun project and I think I’ll be able to wear it with anything and everything. Must feel so good to wear something you put so much love into. It’s perfect ! Thanks Jessie. I know I’m going to love wearing this all the time. 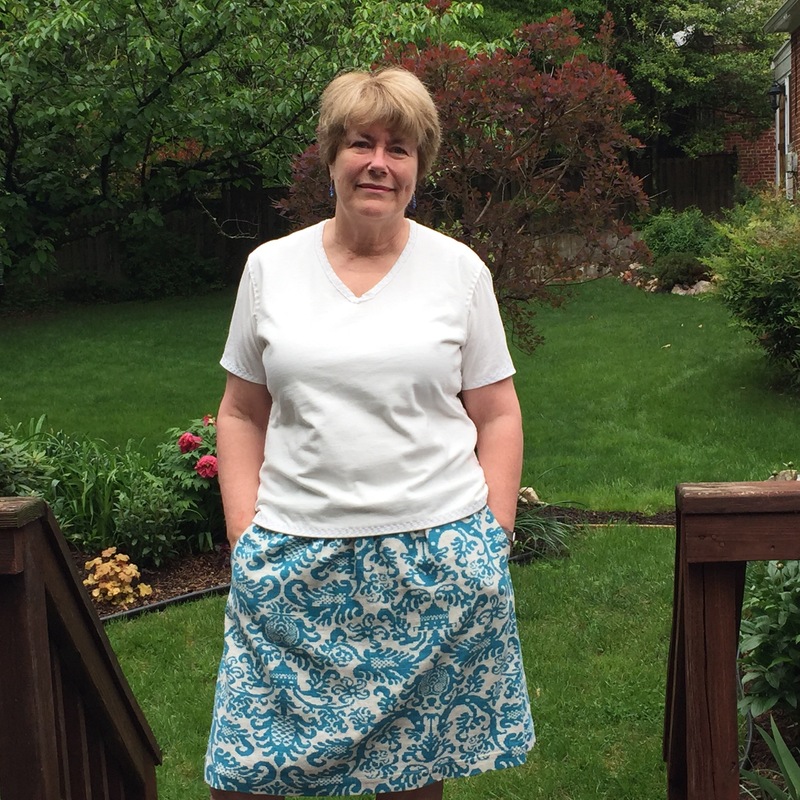 I had to disassemble the shirt I copied to make the pattern and I wore that all the time! This is a much nicer version. The organic cotton knit is SO wonderful. Gorgeous shirt and skirt, too! 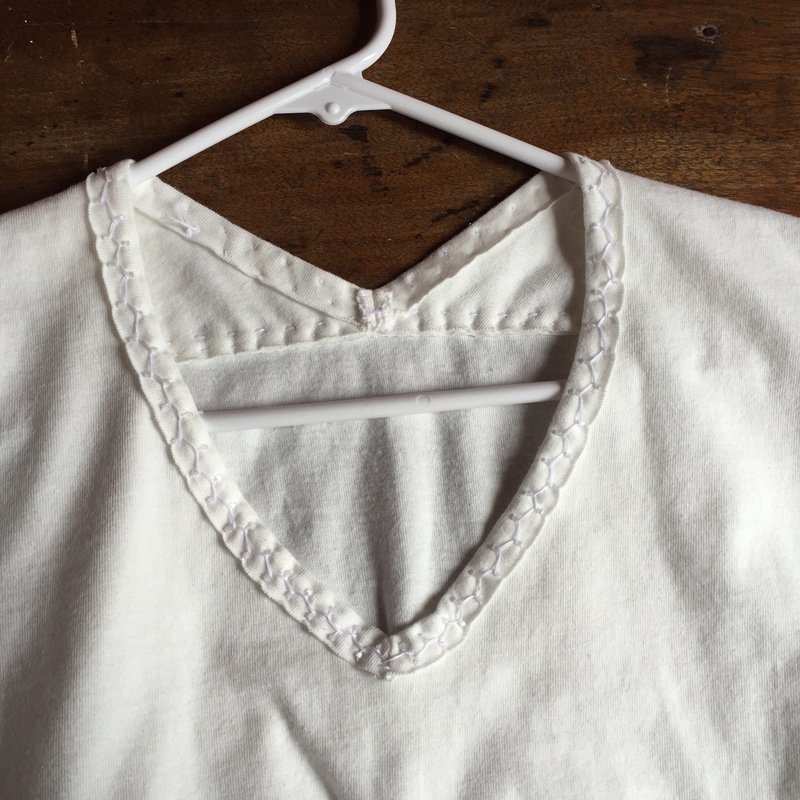 Love the little chop beads – found this googling V-neck Alabama Chanin because I was too lazy to pull my books out for the 5th time – thanks for giving me the page number!